Last May, the Islamic State of Iraq and Al-Sham (ISIS) shocked the Syrian government with a large-scale offensive to seize the vast desert area of the Homs Governorate. In one week, ISIS captured the oil rich town of Al-Sakhenah and the ancient city of Palmyra (Tadmur) from the overstretched Syrian Arab Army (SAA), causing the latter to frantically retreat across several kilometers of desert terrain. Adding insult to injury, ISIS would launch another offensive in August to seize the southeastern countryside of the Homs Governorate, which included the ancient Assyrian city of Quraytayn and the Tanf border-crossing. For several months, the Syrian Armed Forces repeatedly attempted to regain the territory around Palmyra and Quraytayn; however, each offensive ended in disappointment, as ISIS’ defenses proved too strong. Part of the problem for the Syrian Armed Forces was the scarcity of military personnel to maintain the recaptured territory that was seized from ISIS. As a result of their shortcomings around the country, the Syrian Armed Forces received the greatest gift they could hope for in late September when the Russian Air Force entered the war. Not only were the Russian airstrikes against the enemies of the Syrian government frequent, they were also incredibly powerful. Now, with ISIS forestalled around Palmyra and Quraytayn, the Syrian Armed Forces are in position to conduct their highly anticipated desert offensive to reclaim this oil rich part of central Syria. Leading the way for the Syrian Arab Army (SAA) are the prominent commanders of the Tiger Forces, Colonel Suheil Al-Hassan and Colonel Shady Al-Isma’el. Fighting alongside the Tiger Forces and the Syrian Arab Army’s 67th Brigade of the 18th Tank Division will be the powerful pro-government paramilitary factions: Liwaa Suqour Al-Sahra (Desert Hawks Brigade), Dara’ Qalamoun (Qalamoun Shield), the National Defense Forces (NDF), the Syrian Social Nationalist Party (SSNP), and Kataebat Al-Ba’ath (Al-Ba’ath Battalions). 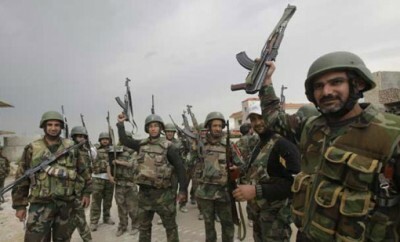 In addition to the Syrian forces, a number of foreign groups are participating in the operations to liberate Palmyra, including Hezbollah (Lebanese), Harakat Al-Nujaba (Iraqi), Liwaa Al-Badr (Iraqi), Liwaa Imam ‘Ali (Iraqi), and Kataebat Hezbollah (Iraqi). Overseeing all of the desert operations will be the military advisers from the Russian Marines and the Iranian Revolutionary Guard Corps (IRGC). The Syrian forces have already made several advances over the last few days; however, the main offensive has not begun yet. According to a senior officer from the Tiger Forces, the massive desert offensive is set to begin in the coming days, but it will be contingent on a number of environmental factors. The Syrian Arab Army’s Central Command and their allies have been planning for this offensive for a long time now; it is expected to be the largest military operation to take place during this brutal war.